Create special moments with this Designed Celebration Floral Bouquet when you are together with your loved ones. We've decked out our bestselling Bouquet for the holidays Inspired by the beautiful Flowers like 15 Mixed Roses nicely packed in a Tissue. 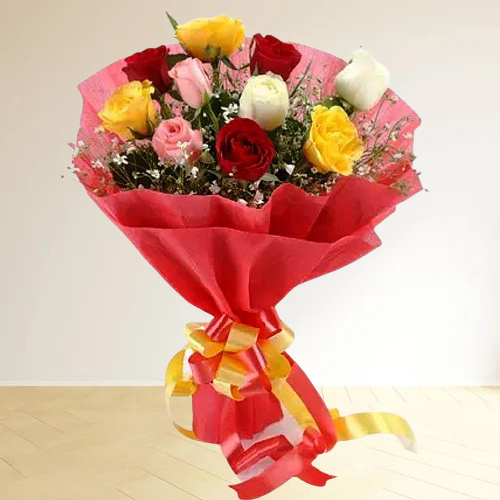 Flowers Delivery Bilaspur, Send sweets Jaipur, Wedding Cake Trichur, Diwali Mithai Trivandrum, Send Flowers and Gifts to Jaipur, Online Shop Udaipur, Flower to Kannur, New Year Flowers Panipat , Fresh Fruits Solapur, Send Gift Jallandhar, Dry Fruits to Shimoga, Birthday Delivery Sikar, Sending to Hosur, Flower shop Modinagar, Erode Online Cake Delivery.